To decide on the style first think if you are going to wear your ring set every day. If so, it should not only be beautiful but practical. The style should be elegant enough to go with most of your cloth. What wedding ring set styles are available to you? Most popular is a set that consists of a classical ring with a single diamond and a ring with channel set diamonds. But there are other possibilities. If you like something more elaborate think of engraved style or a beaded edge style. There are also vintage wedding ring sets and Celtic style bands. The best way to find a style you like is to visit a big online wedding ring shop. Don’t mind the prices for now, just look at different ring set styles they offer and see what you like the most. After deciding on the style, you will have to make up your mind about the material for your ring set. 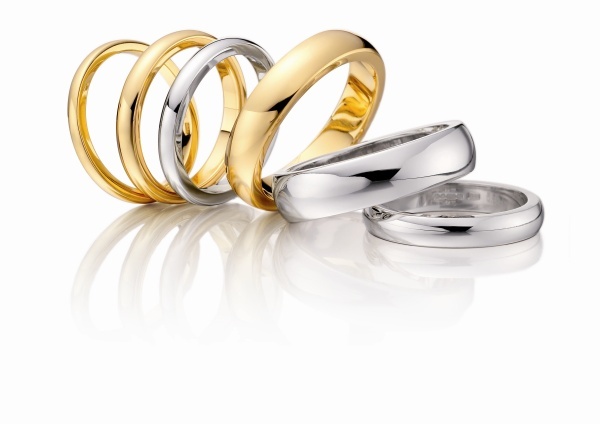 Here you have a choice of gold, white or yellow, platinum and titanium. But even before you go for a particular material asks yourself do you want a yellow wedding ring set or a white set? If you want yellow, than your only choice is traditional gold. White wedding rings are becoming more popular in recent years, because they look more modern and easier to match with any cloth. Think of the other jewelry you own and wear often, will white or gold go with most of it? Also think of how much you can afford to spend on your ring set. Most expensive is not necessarily the best. If you go for a cheaper metal, you can have a set with bigger, better quality diamond. Yellow gold wedding ring set is the easiest to find. Yellow is traditional and also it has that warm feeling that is associated with marriage. When looking for traditional gold sets most people think that more carats (more pure the gold) the better. This is not always true. Gold is a very soft metal, and 24 carats gold ring can get scratches easily. For the purpose of durability 14 carats gold ring sets are the most popular, but if you want more pure gold, 19 carat is a good balance between purity and durability of your ring. Platinum is an excellent material if you can afford it. Platinum rings have a whiny white look and last forever without a single scratch. Platinum doesn’t come in carats because the metal used in jewelry is pure and not mixed with any other metals. Titanium ring set is another option. Titanium doesn’t shine as much as platinum or white gold, but it has a stylish modern look, it is very durable and not as expensive as platinum. Titanium wedding ring sets are not as widely available as ones from other metals, so you will have to do a special search online for them. If you decide on the style, price range and material for your wedding ring set in advance, it will be much easier to find a perfect set. You can look at different jewelry stores and department stores. Actually department stores often have wedding ring sets on sale, so you can get a good deal. If you don’t find anything suitable locally, search for your ring set online. There a hundreds of jewelry shops online, they offer great selection or rings and the prices are usually better than in traditional shops.